FIGURE 5. Schematic showing trunk neural crest cell migration pathways and derivatives (also see Fig. 1C). Neural crest cells migrate ventrally through the sclerotome to form neurons and satellite glia in the dorsal root ganglia and sympathetic ganglia, chromaffin cells in the adrenal gland (and Schwann cells on the ventral root; not shown). 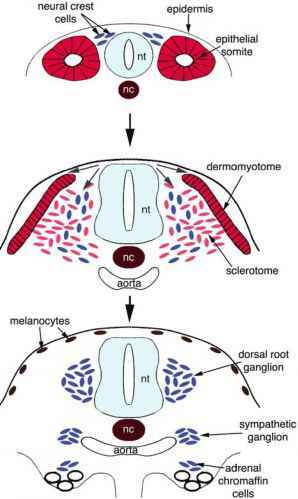 Neural crest cells also migrate dorsolaterally beneath the epidermis to form melanocytes. nc, notochord; nt, neural tube. migration (Rickmann et al., 1985; Bronner-Fraser, 1986). This pathway is almost identical to that followed by motor axons as they grow out from the neural tube, shortly after neural crest cells begin their migration (Rickmann et al., 1985). Mouse neural crest cells are similarly restricted to the rostral sclerotome (Serbedzija et al, 1990). Neural crest cells that remain within the rostral sclerotome aggregate to form the dorsal root ganglia (primary sensory neurons and satellite glial cells), while those that move further ventrally form postganglionic sympathetic neurons (Fig. 8; section The Autonomic Nervous System: An Introduction) and adrenal chromaffin cells (Fig. 5C). The restriction of neural crest cells to the rostral half of each somite therefore leads to the segmental distribution of dorsal root ganglia; as will be seen in the section on Molecular Guidance Cues for Trunk Neural Crest Cell Migration, it results from the presence of repulsive migration cues in the caudal sclerotome. Neural crest cells that delaminate opposite the caudal half of a somite migrate longitudinally along the neural tube in both directions. Once they reach the rostral half either of their own somite, or of the adjacent (immediately caudal) somite, they enter the sclerotome (Teillet et al., 1987). Hence, each dorsal root ganglion is derived from neural crest cells emigrating at the same somite level and from one somite anterior to that level. In contrast, each sympathetic ganglion is derived from neural crest cells originating from up to six somite-levels of the neuraxis: This is approximately equal to the numbers of spinal cord segments contributing to the preganglionic sympathetic neurons that innervate each ganglion (see Fig. 8) (Yip, 1986). There are some differences in the ventral neural crest migration pathway between different vertebrates. In fish and amphibians, the somites are mostly myotome, with very little sclerotome. In these animals, the ventral migration pathway is essentially a medial migration pathway, between the somites and the neural tube/notochord. In Xenopus, neural crest cells following this pathway give rise to dorsal root ganglia, sympathetic ganglia, adrenomedullary cells, and also pigment cells (Krotoski et al., 1988; Collazo et al., 1993). This is also a segmental migration, but in this case, the neural crest cells migrate between the neural tube and the caudal half of each somite (Krotoski et al., 1988; Collazo et al., 1993). The ventral pathway is the main pathway followed by pigment cell precursors in Xenopus; only a few pigment cells follow the dorsolateral pathway beneath the ectoderm (Krotoski et al., 1988; Collazo et al., 1993). In zebrafish, neural crest cells enter the medial pathway at any rostrocaudal location; however, they subsequently converge toward the middle of the somite so that their ventral migration is restricted to the region halfway between adjacent somite boundaries (Raible et al., 1992). 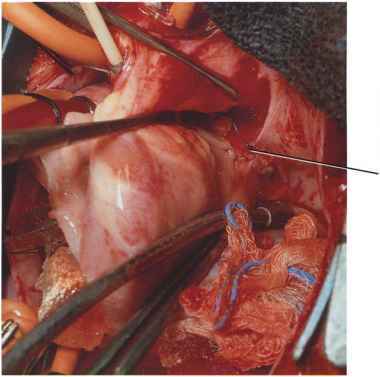 Rostral sclerotome precursors and motor axons also follow this pathway toward the center of the somite. However, rostral sclerotome cells are not required for this convergence of neural crest cells and motor axons, suggesting that unlike the situation in avian embryos (section Molecular Guidance Cues for Trunk Neural Crest Cell Migration), neural crest and motor axon guidance cues are not derived from the sclerotome (Morin-Kensicki and Eisen, 1997).